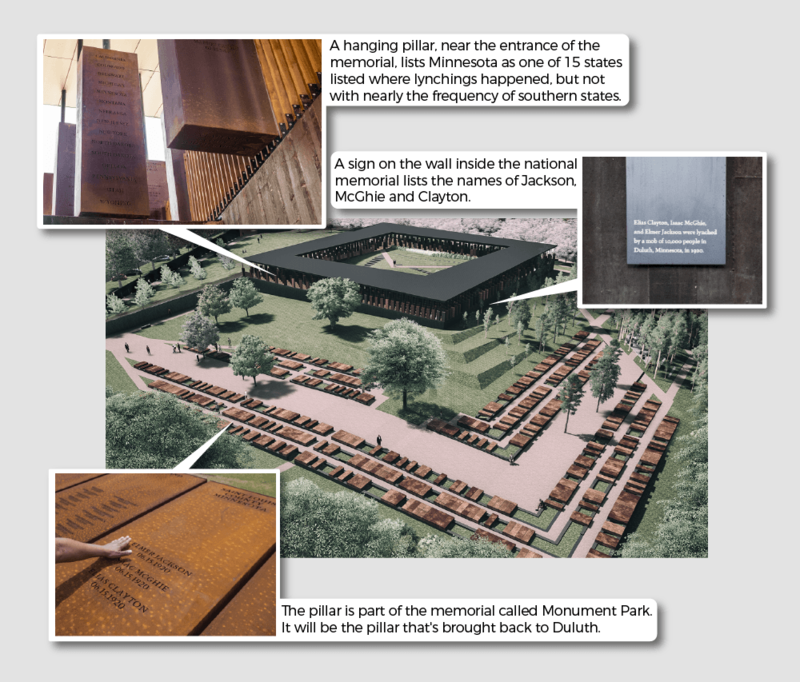 Editor's note: MPR News reporter Tom Weber and photojournalist Evan Frost traveled with people on a bus from Duluth to Montgomery, Ala., for the opening of a memorial to honor the thousands of African-American men, women and children that were lynched in America. This is the latest installment in the series. When three men were lynched in downtown Duluth on June 15, 1920, early newspaper reporting mislabeled one of the victims as Nathan Green. The story was quickly corrected. Elmer Jackson was lynched, not Nathan Green. 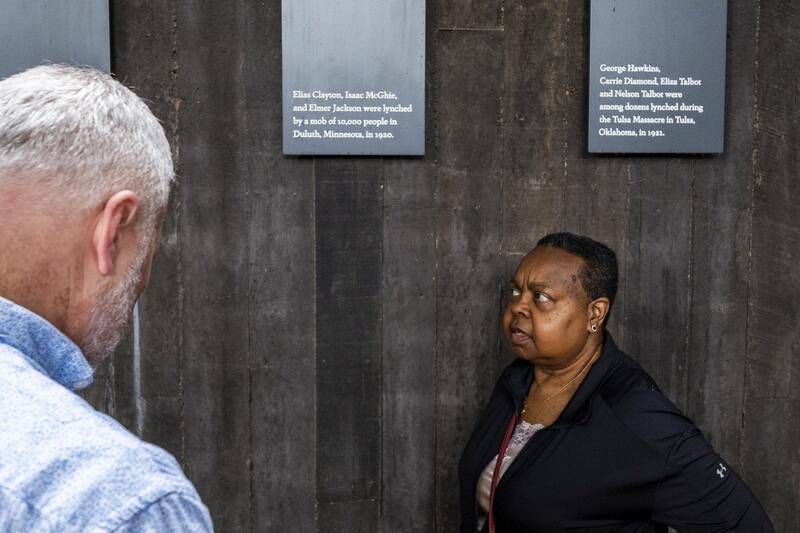 But during the April opening of the new national museum and memorial dedicated to victims of lynching, Green's name was erroneously affixed to a jar of soil taken from Elmer Jackson's gravesite. The jars — 280 in all — are a moving part of the Legacy Museum. 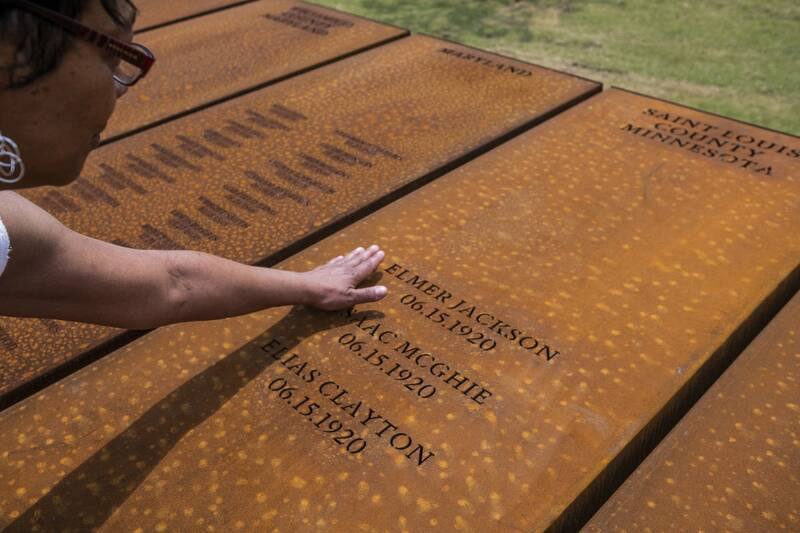 The Equal Justice Initiative, which built and operates the museum and nearby memorial in Montgomery, Ala., collected soil from the lynching or gravesites of victims across the country. Three of the jars on a wall of jars are for the victims of the Duluth lynching: Elias Clayton, Isaac McGhie and Elmer Jackson. "It was hard to see it was wrong," said Virginia Huston of Independence, Mo., who is a descendent of Jackson. She alerted staff to the error and felt sure they'd fix it, she said. "I touched the jars of all three to let them know there's somebody's here who cares about them," she said shortly after leaving the museum for the first time on the day it opened to the public. The names were affixed with a sticker that made it relatively easy to switch out and the Green/Jackson error has already been fixed, according to EJI. But in making the mistake, the organization showcased the complexity of researching the era. "Oftentimes the mainstream press's coverage of these lynching events was something that would not hold up to journalistic integrity by today's standards," noted Kiara Boone, deputy program manager at EJI, in a recent MPR News interview. In researching all lynchings, Boone added "some of the early newspaper articles had parts that were fabricated. There are inherent challenges in trying to uncover and verify this history but it's important to do." Those challenges, Boone notes, make up the very nature of the museum. Lynching was a way for one population of humans to mark another as not human. If the point is to dehumanize, what difference does it make if they're properly identified? During its research, EJI found hundreds of times when a lynching victim's name was missing. Those time are visualized in the more than 800 columns engraved with names of victims and the dates of their deaths. For those whose names are not known, the word "UNKNOWN" is engraved. The columns each represent a county where a lynching occurred. One striking example is from Anderson County, Texas, where 15 people were killed in a mass lynching on July 31, 1910. Their names were not documented. "We had to go to communities to get documents that weren't digitized or available in any other way," said Boone. "We always stress the numbers we have are the numbers of lynchings that were documented in some way and we know there were lynchings that weren't uncovered in our research. "We anticipate this list of names and locations will continue to expand and it's our hope and duty to evolve that research," Boone said. Warren Read knew that history when he walked through the museum last month during the opening because of the research he has done for his book "The Lyncher in Me." The book tells Read's story of learning his great-grandfather helped incite the riot that led to the murders. "It was disappointing but I understand the error," he said while sitting next to Huston after visiting the museum for the first time. The two have been friends since they learned the history that binds their family histories. "It was a weird moment because when I saw the other names — Isaac McGhie and Elias Clayton — I felt myself getting emotional. And then I couldn't see Elmer's name. In a weird way it was almost a relief," he added. "Isn't that weird to say? As if it didn't happen. "But," he added, "we know it did." 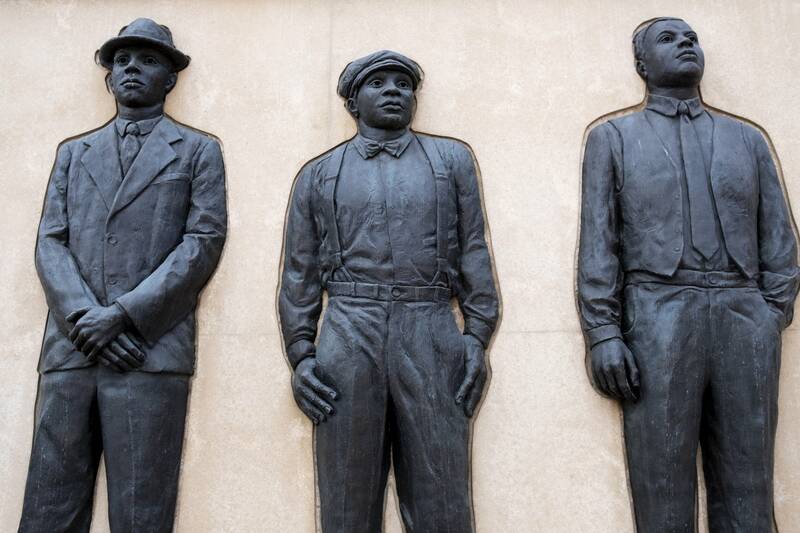 In the last of its Duluth to Montgomery series, Tom Weber will explore the friendship between Read and Huston on June 15 — the 98th anniversary of the Duluth lynching.